Azamgarh, the place that gave birth to litterateurs like Shibli Nomani, Rahul Sankrityayan and Kaifi Azmi apart from innumerable other luminaries, has lately been associated with crime and terror. Irresponsible reporting by channels like India TV that ran special programmes titled 'Aatank-garh' [House of Terror] have demonised the place. 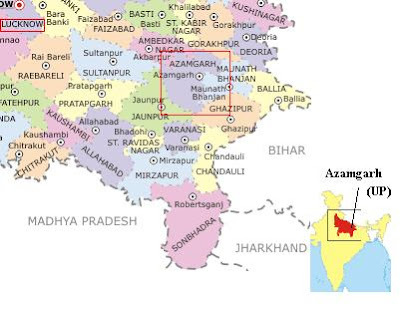 Little did the sensationalists realise that Azamgarh is not a mere City or a town, it's a district that has scores of towns and hundreds of villages. In fact, Azamgarh is the third most populous districts in Uttar Pradesh (UP). It's population was 40 lakh (4 million) as per the last census (2001). Though the Azamgarh town has barely a population of over 1 lakh. Today the residents [not just Muslims of Azamgarh] of the district are angry. Irrespective of their religion, they share this anger. Any youth belonging to this district can't find an accommodation in Lucknow or any other City of UP, let alone other states. Either he has to lie or just forget getting a place to live on rent, unless it's a very close friend or relative. Such is the situation that policemen interrogate and pick normal youths in trains and during bus journeys just in case the ticket shows that their destination is Azamgarh or because they belong to that place. It has sadly become Azamgarhi=Criminal. Youths from Azamgarh are randomly caught across the country and kept under illegal detentions. Nobody disputes that a criminal or an accused should be caught. But the branding of the town has hurt the citizens. 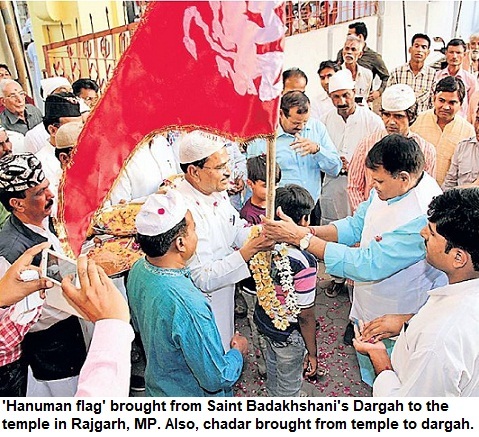 Incidentally, it is believed that Azamgarh has a Muslim majority. In fact, it doesn't have a higher percentage of Muslims. 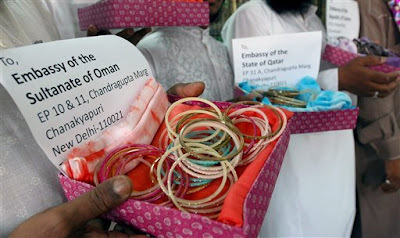 The district has around 13% Muslim populace, which is less than the average Muslim population in UP that stands at 19%. However, in Sarai Meer, Azamgarh, Sanjarpur and other towns in the district, Muslims do form a large population, often in majority in these places. The mafia that has active in Eastern UP has flourished due to the contracts of PWD and railway. Lack of development kept this region poorer. Mafias like Ramakant Yadav, Abu Salem and Harishankar Tiwari have been active in this region. The rise of Mahant Aditya Nath and his Hindu Vahini Sena has also led to counter communalisation. After the Ijtima congregation that was held in Azamgarh, the saffron organisations targeted Azamgarh. No doubt, the gangsters, criminals and sharp-shooters of Azamgarh have brought notoriety to this place. After the Batla House encounter, the place almost became notorious. 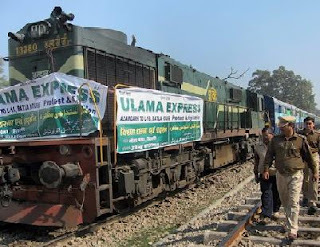 Now hundreds of Muslim youths under the banner of Ulema Council is reaching New Delhi to raise their voice against the branding of Azamgarh as a den of terrorism and criminals. They also want inquiry into the Batla House encounter that took place last year. Recently, Talha, the son of Maulana Amir Rashdi Madani, was arrested in Nagpur. Midway on the train journey he was detained and taken away. After several days, it was revealed that he was in police custody and when he was released, he was reporteldy warned not to make any statement or go to the media. He works with a private company in Bangalore and the police had earlier claimed that he was the fourth 'terrorist' who escaped during the Jamia Nagar's encounter. Later the court let him go due to lack of any evidence. Such incidents have been quite common. 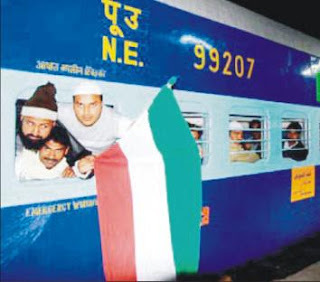 It is to protest this generalisation that the chartered train is taken to Delhi. A demonstration will be held at Jantar Mantar where the clerics and Azmagarh residents will speak out over the alleged mistreatment, common citizens are subjected to, lately. Read and Watch Azamgarh Speaks, an extraordinary special series on Twocircles.Net that reveals the various aspects of Azamgarh and Muslims. Despite the hoopla and the advertising blitz projecting Lal Krishna Advani as the Prime Ministerial candidate, it seems difficult that the BJP will be able to form a government at the Centre on its own. It's current tally in the parliament is a mere 138 and even if it manages to reach it's zenith (which was 182 when Atal Bihari Vajpayee was active and campaigned extensively) it will have to search for coalition partners to somehow reach the magic figure of 272. Isn't that odd for a party that promises an alternative to the old and weary Congress? 1. After Babri Masjid demolition, Muslims were angry with the BJP but they were not happy with Congress either. The wounds took time to heal and by late-90s there was a small minority of Muslims that had begun voting for BJP in some constituencies. 2. Then occurred the Gujarat carnage. Atal Behari Vajpayee as Prime Minister did ask Narendra Modi to perform his 'Raj Dharma', but that was an eyewash and aimed at keeping his image of a more inclusive and comparatively secular politician intact. 3. Six years down the line, Muslims haven't forgotten Gujarat, but they also know that innumerable riots occurred in India during Congress regimes. The Babri Masjid-Ram Janmabhoomi dispute occurred due to some Congress leaders who had reignited the controversy with the the shilanyas in 1986 and that the social condition of Muslims reached its nadir during 40 years of Congress rule at the Centre and states. We will not provide any reservation or any preferential treatment to Muslims but will ensure that like rest of the citizens, their lives and property would be safeguarded, riots will be checked effectively and we'll open schools, dispensaries and hospitals in Muslim concentrated areas. Is this too much an expectation from a national party? This is something basic any responsible political party should say. But the BJP doesn't make even such a promise. What holds it back: Kyaa niyat kharab hai? BJP claims to be the national alternative to Congress but it doesn't address nearly 175 million Muslims and Christians. It doesn't even treat them properly. At the ground level, its cadre is the same as that of VHP, Bajrang Dal and RSS. And in riots, it allows its workers to run amok when it is running a state government. Unlike other parties the BJP has to be content with mostly non-minority votes in states other than Punjab. So, effectively it has to get more votes from lesser number of electorates. While a candidate belonging to any other party including Congress can expect votes from all sections, the BJP candidate stars with a disadvantage. If in a multi-cornered contest, a candidate generally wins if he secures over 30% votes (obviously out of 100), but the BJP candidate has to get his 30% from less than 85% (minus Muslims). If one looks at the chart showing BJP's vote percent, it's quite clear that it hovers around 22%. If it snatches just a section of Muslims (13.4% of India's population) from Congress, then it can easily beat the Congress. But many Muslim leaders who joined the BJP later felt that the party was just not interested in the welfare of the community. Its middle-level leaders are often from such background that when in states they head departments like Waqf Board, Urdu Academy, Madarsa Board or Haj Committee, they further damage these institutions by cutting grants and trying to impede their functioning. This negative thinking forces Muslims to either go to Samajwadi Party, RJD, Leftist (Communist Parties) and even JD (U) in states where the third front exists or back to Congress due to the TINA factor (There Is No Alternative). Thus BJP refuses to become an alternative to Congress. Though LK Advani's website now has an appeal for Urdu-speakers (Muslims)also. The Urdu content has been added recently. Senior journalist Aakar Patel has summed it up quite well. He writes that the party that claims to be Indian People's Party governs six states with a population of 190 million (19 crore) that has tens of millions of Muslims but neither it has a Muslim minister (or MLA) in Gujarat, nor in Madhya Pradesh. In Himachal Pradesh, Chhattisgarh and Uttarkhand also it has no Muslim minister in the cabinet. In Karnataka there is one Muslim minister to manage the Waqf and Minority affairs. There is a void in Indian politics. People who are fed up with Congress and want to teach it a lesson, don't know what to do. BJP could have filled the space. It talks about appeasement all the time, but when it comes to power, it appeases the right-wing Hindutva constituency and forgets that inclusivity is essential to run a nation. It can start gettting Muslim votes just by taking the community in confidence and promising them that there will be no injustice or step-motherly treatment. But it stops far short of that. And that's the tragedy of our national politics that the only national alternative to Congress is afraid to promise protection and respect to a section of its citizens. 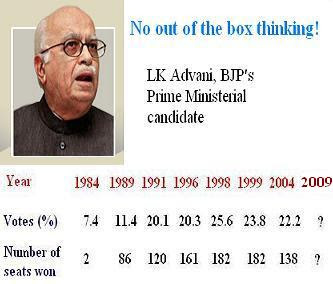 The general elections are just a few months away and we will know whether Advani manages to get to the post of Prime Minister or leaves the field for the next generation of BJP. 1. 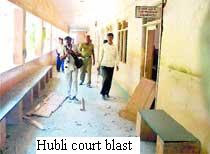 I am writing this post a few days after the recent revelation that the Hubli court blast and the planting of bombs on National Highway-4 [Belgaum-Dharwad] were carried out by Nagraj Jambagi's 'module' rather than any Lashkar or SIMI group. This hasn't been adequately reported in media though immediately after the blast, it was blamed on 'Islamic' terror groups. Nagraj is known to have links with Sri Ram Sena, a radical* organisation that was involved in attacks on Churches in Karnataka. During the recent elections, the BJP had used it in its campaign. But now when it turned out Nagraj confessed his involvement, the few newspapers that carried the report of the press confernece reported that it was 'not a terror attack'. Why? Is it because there was no Muslim involved? Just a few papers who at least reported it, gave it a twist like the Midday headline 'Hubli court blast no terror attack'. It's not a joke but it has been made a joke. One should never use terms like Islamic or any other form of terrorism but it is used and when it is found that there is no Muslim angle, the act goes out of the definition of terrorism. Isn't it strange? What if it was an act by a Muslim criminal whose name, one can imagine, as an Abu X or Abu Y. Would the media have later described him as a dacoit involved in gangwar [to take off the terrorist tag] as Indian Express reported it later, rather than terrorism? A few English papers in Southern India reported it [Link to Rediff news report]and also the fact that the bombs were similar to those used in Mecca Masjid blasts, but nothing appeared on TV. Especially mainstream North Indian papers ignored it. These things need to be highlighted, discussed and answered. Rediff.com reports that the aim of Nagaraj's men was to take revenge and attack SIMI members who were brought to courts. 2. In the last three months, Assam was thrice targeted by terrorists--the first strike in October last year claimed 90 lives. The recent two bomb strikes including the one on January 1 got little attention in mainstream media though several persons died. Surpisingly the third blast that occurred on January 9 almost got unreported in the mainstream media. As I write it today, I can see a blast in Afghanistan getting far more coverage, as if Assam is not part of the country. When the first of the recent series of three blasts occurred, self-styled media's terror experts suggested the names of obscure and known organisation with Arabic sounding names. Within a day, it disappared from frontpage of newspapers and channels as it always happens in the case of Assam or Naxalite infested areas. But investigation was pointing towards Ranjan Daimari alias Nabla. He is leader of the separatist pro-Christian Bodoland movement 'National Democratic Front of Bodoland'. However, as in other cases we didn't get to see the photographs of Nabla, because he was suspected, on TV channels. Ultimately it was Pranjal Deka, who emerged as the main mastermind of the blasts. Just a week or two back he has been killed in a cross-fire in Assam. Pranjal Deka alias Biju Sarania, was one of the three ULFA militants, who had planted three bombs that rocked Guwahati on Januar 1, was killed in an encounter with security forces, writes Samudra Gupta Kashyap in the story in Indian Express. Just one question, why Dekha is described as a Militant and not a Terrorist? Again, it is not Jambagi, DR Nabla, Pranjal Deka or many others whose faces we never get to see on TV or papers though they also appear in press conferences and get produced in courts. 3. We live in a so-called enlightened era. We know it is extremely insensitive and risky to brand entire communities. We all know and more than us it is media that should know. As we write and read this, LTTE, a predominantly Hindu organisation fights to retain its base in Buddhist-dominated Sri Lanka. It's not Muslims who are fighting there either. Still, what seems to sell on papers and media is 'Muslim faces' and 'Islamic terror'. The dreaded-ness probably increases when the photo of a Muslim 'Abu X, Y, Z' appears rather than a Pranjal Deka, as the beard or a skullcap gets fitted on the head. This makes him look bad as popular imagination has been fed over the years in this manner. 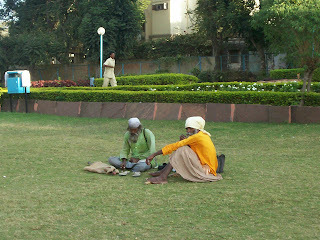 It was a dull winter day last month when I had first seen these two men--one wearing a saffron robe, the other in a green garb, sitting together in a park. I just wanted to be with myself and had decided to go to a park all alone, staying away from office, Internet and the never-ending works. It was then that I saw the duo sitting leisurely. It was around a week later that I again visited the same park and saw them. A vendor was selling traditional salted white papads that are made of rice along with 'Gur-laiya ke laddoos'. I bought them and sat with the duo, offering them the laddoos. The conversation began. 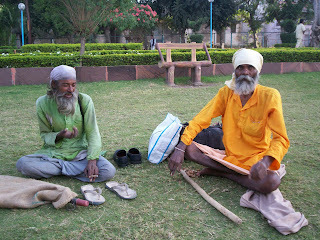 Bhagat Ji looks after the samadhi of his guru while Baba is caretaker of a mazaar and a Khanqah (hospice) near it. Sick of endless debates over communalism and politics after the Mumbai terror attacks, it was a relief to meet the duo--who sit at the same place every day in the afternoon. Bhagat Ji has interesting tales to tell. He speaks about his guru and his last moments when he took samadhi. He also told me story about a Nawab who had later become a Sufi and after his death, still seen walking around his mazaar where he comes to attend the weekly Thursday night assembly of 'murshads'. But more than their mysticism, it is the harmony of their beliefs, that pulls you. They are totally at peace with themselves and the world around. And what strikes me more is the 'naked non-bookish wisdom', the ability to see that the history of wars and strifes have been as old as human life on this planet. That they don't get charged up and take positions on the basis of their religions. Both believe in God and see no contradiction in each others' beliefs. It is this Indian tolerance and mysticism that has driven this nation though toughest periods in history, not the 'spirit' preached on hysterical TV channels. We see amplified images of every emotion, forgetting that our true strengh and resilience lies in our millions of towns and villages and the countless--Bhagat Jis and Khanqah Wale Babas, who live side by side and in perfect harmony. Though they had invited me, I couldn't go to see the Tazia taken out in the locality. They are closely involved with the making of tazia and the accompanying riutals. Incidentally, that Tazia is also taken out by descendants of a Hindu family. In fact, it is these people who give you the glimpse of the real India and the beliefs of the ordinary Indians who remain unaffected by rabble-rousers. They are so close to us but we just don't see them as we are stuck in the rot of our lifestyles where we see every thing through TV and newspapers. They are not like self-styled godmen who preach against materialism on TV but want both disciples and dough. Rather, they are satisfied in their lives, quietly.The educated may fight like cats and dogs but they smoke with the same 'chilam'. Bhagat Ji passes it to Baba who leaves a thick fog of smoke, as I left. [No race suffered as much as the Jews in human history. They were killed, tortured, gassed, kept in concentration camps, but today as Israel bombs Palestians, killing innocent children, Israel has become a Nazi state, for us. Israel, the country of the persecuted, is behaving exactly, the way Germany under Hitler, acted against them. Hitler believed that he was right. Today, the state of Israel refuses to believe that they are oppressors, involved in the most brutal acts, and in no way less in magnitude than the Nazis. As a child I had read about the horrors of Holocaust, the mass killings of Jews by Eichmann and Hitler, their persecution and also read the 'Diary of Anne Frank'. It was all disbelieving how such massacres could happen. Despite the Muslim world's suspicion of the Jewish state [more so it is Zionism], the story of Jews evokes empathy. But isn't it the irony that the people, who suffered the most in human history, for being a minority and were the worst sufferers of genocides and discrimination, have resorted to the same crime when they got their homeland. 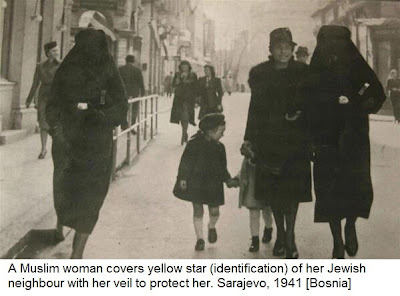 They forgot that how the same Muslim world had treated them better and gave asylum whenever Europe persecuted the Jews. Today the same Jews whose forefathers lived in concentration camps and were gassed to death, force another minority, the Palestinians to live in concentration camps, bomb them, kill them and use gases & chemicals that cause miscarriages of women. I just don't understand! 2. They were held responsible for epidemics like plague and were set afire. No less than 900 were burnt alive in one City, Strasbourg, alone. In India they lived in peace but when Portuguese reached, they persecuted them here also. 3. Through out 12th, 13,th, 14th, 15th...till 18th century this continued. During inquisition they were burnt and killed in thousands, the children separated from families and were forcibly baptised. In Europe, Jews were forced to live in ghettoes, special taxes were meant only for them and at several places that had to wear particular dress or badges that would distinguish them from the rest and it invited extreme ridicule. 4. There was the King Friedrich who ordered that all Jews be converted. The myths that Jews had pact with Devil and that they had magical powers and caused deaths of children, were spread in medieval England and Europe. 5. Then came the Holocaust of the 20th century and the mass killings of Jews in Hitler's Germany. The horrors of this holocaust are known and well documented. It was after this that post-World Wars, 'enlightened' Europe shed its moral guilt and shifted 'their problem' from Europe to the Middle-East (in Asia) and got rid of the trouble. There were collective suicides, of jews and burning of entire villages happening as late as 20th century. 6. Now Jews had got their homeland and they forgot all enmity, all past persecution and the Arabs were also soon ready to believe that Jews were there eternal enemy. Today Jews and Zionists have forgotten all. I don't say that Arabs have been great. My blood doesn't boil because Arabs are Muslims. I am just sick of seeing innocent children who ought to be in the crib or play games, lying in blood and kept in stretchers or taken to grave yards. This is sickening. They have turned Gaza into concentration camp. Still, after this saga of colossal persecution, they didn't learn and the state of Israel is today symbolising Hitler and outdoing him in his actions. O Israel, what you learnt from Holocaust. In seven decades, you have become the same monster. Today, Israel is a Nazi state. Yes, it is a Nazi state, a terrorist state. Shame on Zionists, the state of Israel and the United Nations. 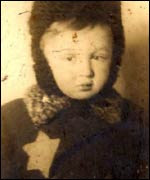 [First photo courtesy BBC website: Jewish child wearing a yellow star in Europe in the early 20th century. 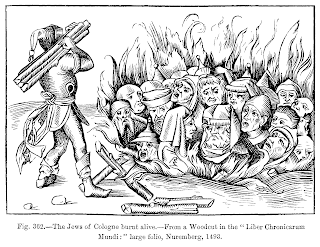 Link] The other photo shows a medieval painting of Jews being set afire in Cologne. 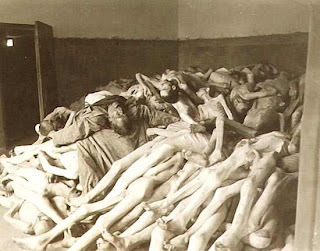 The last photo is of a concentration camp of Jewish citizens during the Holocaust in Germany. Was 2008 worst year in Indian history post-independence? The year 2008 was bad for the country. There is no doubt about that. Apart from Mumbai, there were terror strikes in Ahmedabad and Jaipur, serial blasts in Bangalore, Delhi and other major militant strikes in Assam & Manipur (which many forget). * Caste conflicts like the Gujjar-Meena rift paralysed parts of Northern India for long. * Amarnath Yatra, a great tradition was communalised. * Raj Thackeray's MNS let loose its cadre on non-Marathis, a form of politics that threatens to divide the country and hurts the nation from within. For a time, even speaking Hindi had become a crime and even Amitabh Bachchan was ridiculed. The issue of immigrants even brought publicity to a film, Deshdrohi. On a lighter note, the promos of which were amusing. * Malegaon case investigation brought to fore the involvement of Hindutva extremists in bomb blasts. Sadhvi Pragya became the face of this form of terror, and TV channels loved it. Some Shiv Sena leaders even sort of justified the 'reaction'. 1. This was apart from the natural calamities like the change in the course of Kosi river in Bihar that affected the lives of millions. Two million were displaced and the figure of deaths can only be a guess. 2. Though the year had started well for India. The great unifier, the common religion, cricket had brought cheers when India outperformed Australia. The launch of Nano was announced. There was enthusiasm over nuclear deal among middle class and US presidency [Barack Obama]interesting Indians like never before. Lot of good news was coming. But as the year progressed terrorism reared its head and by year end the November 26 terror strikes brought a sense of gloom and anger. Union Home Minister and the Maharashtra CM had to bear the brunt. The meltdown and the loss of jobs added to the prevailing atmosphere. 3. As bad as 1948, 1984 and 1992? Historian Ramchandra Guha wonders in his essay in Outlook whether it was as bad a year as 1948 when post-partition riots had occurred taking lives of thousands and Mahatma Gandhi was shot dead or 1984 when anti-Sikh riots claimed the lives of 4,000 in Delhi alone and 3,000 had died in Bhopal in the worst industrial disaster of the world apart from Indira Gandhi's assassination. Or 1992 when Babri Masjid was demolished and riots had spread across the length and breadth of Hindustan. In 1984, I was a kid and have memories of those turbulent times but we only had DD then. The situation wasn't too different in 1992 though BBC were aired by then. Now we have a 24/7 Electronic media that can shock and scare us as hell and also make us forget a tragedy the very next day. 4. Comparison is the job of historian but for an ordinary person like me, the year 2008 was definitely a terrible dream. As I go to sleep, I wish the new year will see lesser conflicts, our netas will be less irresponsible and our bureaucracy (intelligence agencies) will work more efficiently. As sun rises on January 1, let's hope that 2009 will bring peace and security to all of us. Apart from the above-mentioned conflicts, we have battles which are fought daily--poverty, abysmal health care system, rampant corruption and the widening gulf between the poor and the middle-class. Due to commercialisation of education, the era has come when it is becoming increasingly difficult for a child born in a poor family to get higher education and dream of a great career. I wish that there is national discussion on these issues also. Cynicism is useless. So let's be hopeful and wishing you a Happy New Year.